Kent and Sussex Holiday Cottages is one of the South East's longest running cottage letting agencies covering Kent and Sussex. We are a family run company with a strong reputation for providing quality self-catering holidays in the 250-plus cottages within our property portfolio; all of which are located across our much-loved region. Kent and Sussex Holiday Cottages started some 30 years ago in the kitchen of a cottage in Frittenden, Kent. A single mum and grandma began by offering houses of friends and family and the first brochure featured no photographs at all – only an artist's impression of each property. As the business grew, the office expanded into the sitting room and the company took on their first member of staff! By 1996, the team comprised of four people, and this is when a computerised booking system was developed. In the late 1990's, Kent and Sussex Holiday Cottages relocated to Cranbrook and also launched a website. We still have our office in Cranbrook – so do pop in and say hello if you are in the area. In recent years, the business has gone from strength to strength. We have a fantastic local team of staff with an in-depth knowledge of the areas and of all our holiday cottages. We are growing year on year thanks to the popularity of UK holidays and repeat customers. We are delighted to present a superb variety of places to stay from bijou coastal cottages to stylish countryside holiday homes in Kent and Sussex. The majority of our accommodation is quality graded by a Quality Assessor so you can be confident that every property meets the stringent requirements demanded by this national scheme. We also have a dynamic marketing team working to promote our holiday cottages. This team includes professionals specialising in IT, communications, marketing, photography, search engine optimisation (SEO) and design. 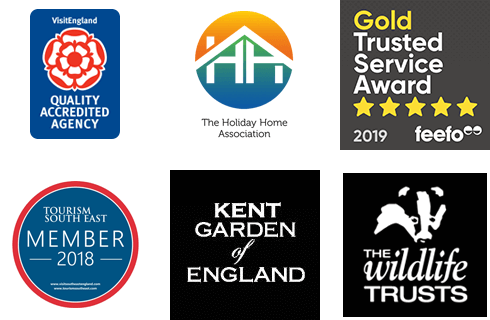 Testament to this is our website, utilising the latest technology and Tabs Online Booking System ensuring that we continue to provide beautiful self-catering cottages in Kent and Sussex for you to book securely and most importantly... to enjoy! First-time visitors are delighted by the peaceful towns and villages and panoramic beauty in this stunning corner of England – it is often a great surprise that somewhere so close to London can be so rural. As well as the lovely countryside, we are blessed with miles and miles of magnificent coastline too. We are always trying to find ways to reduce our carbon emissions as a business as well as sourcing ethically sound and ecologically sound products to use ourselves. Our cottage brochures are printed on 50% recycled paper (the other 50% will be from sustainable sources). We are actively promoting the sourcing of local produce and services by our customers. We are also active members in many local tourism bodies. We hope that leading by example and by doing good things we will inspire others to follow. We politely ask every customer who hires one of our cottages to complete our Customer Service Questionnaire which asks them for their detailed opinion of all aspects of their holiday. So far, we have enjoyed a very high rate of return and are finding the results extremely useful. In the meantime, please see our 'customer comments' on any of the cottage pages and decide for yourself whether we've been working hard enough. It is important to us to provide a quality service and we are always happy to hear from our customers with ideas or ways to improve our service... so please do get in touch. We love Kent and Sussex, and we're sure you will too! Kent and Sussex Holiday Cottages is one of a small group of locally focused brands owned by The Original Cottage Company Limited, which is a family owned private limited company incorporated in England (registered number 06951692) with a registered address at Bank House, Market Place, Reepham, Norwich, NR10 4JJ. VAT No. 595 2110 44.